Collecting moonrocks was more than just reaching down and grabbing pieces we happened to like. The first problem was knowing which rocks, of the many that can bee seen, are worth the time and energy to document, collect and return. But we learned a lot in the six years of geology training on earth prior to going to the moon. It wasn’t easy for hot, right-stuff test pilots to sit through the hours and hours of classroom geology lectures and laboratory demonstrations. We did, however, take right well to the field trips to Arizona, Oregon, Iceland, Hawaii and so forth, locations where the geology was thought to be similar to the moon. Field training was where we honed our skills. The first rock we were taught to select was one that looked most like all the other rocks in the area. The “typical” rock was photographed from two positions before we disturbed the ground. Picking up the rock was not simple, either. 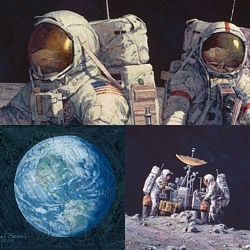 In this painting, John Young is using the long tweezer-like tongs at a site near where Apollo 16 landed. Charlie Duke is inspecting the rock, making specific comments to listeners on earth, then placing the rock in a numbered sample bag. This is a big day for the selected rock, as it has probably been sitting right here for at least 3 billion years, just waiting for some human being to single it out for a quick trip to planet earth.